Mothers holding their children's hands stood in the sprinkling rain, holding up anti-war placards, while students chanted slogans to the beat of a drum against Prime Minister Shinzo Abe and his defense policies. Japan is seeing new faces join the ranks of protesters typically made up of labor union members and graying leftist activists. On Sunday, tens of thousands filled the streets outside Tokyo's parliament to rally against new security legislation likely to become law in September. "No to war legislation!" ''Scrap the bills now!" and "Abe, quit!" they chanted in one of the summer's biggest protests. 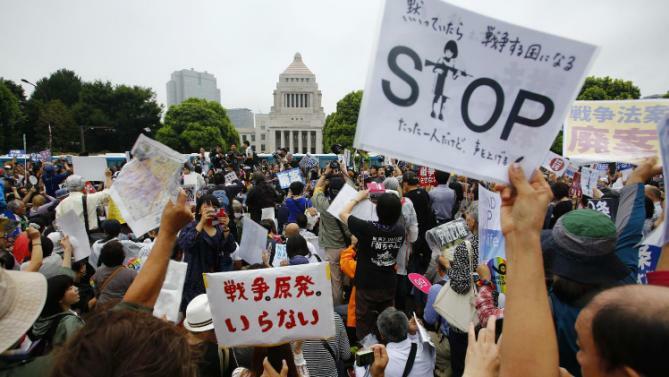 Their cries are against a series of bills that would expand Japan's military role under a reinterpretation of the country's war-renouncing constitution. In Japan, where people generally don't express political views in public, such rallies have largely diminished since the often violent university student protests in the early 1960s. 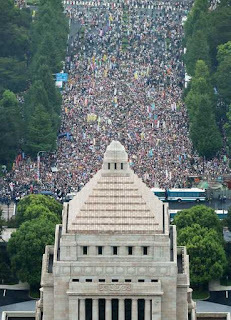 Anti-nuclear protests after the 2011 Fukushima disaster also petered out. Smaller protests were held elsewhere across the nation Sunday. The demonstrations started earlier this year but grew sharply after July, when Abe's ruling party and its junior coalition partner pushed the legislation through the more powerful lower house despite vocal opposition from other parties — and media polls showing the majority of Japanese opposed the bills. Whether the protests' momentum signals wider social change remains to be seen. They could die out once the summer holiday is over and the legislation is passed, as is widely expected. A group called Mothers Against War started in July and gained supporters rapidly via Facebook. 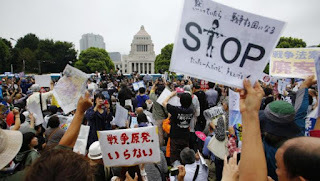 It collected nearly 20,000 signatures of people opposed to the legislation, which representatives tried unsuccessfully to submit to Abe's office last Friday. "I'm afraid the legislation is really going to reverse the direction of this country, where pacifism was our pride," said a 44-year-old architect who joined Sunday's rally with her 5-year-old son. She identified herself only as A. Hashimoto, saying politics is still a sensitive topic among parents at her son's kindergarten. "I feel our voices are neglected by the Abe government," she said. The bills would permit the Self Defense Force to engage in combat for the first time since World War II in cases of "collective defense," when Japan's allies such as the U.S. are attacked, but Japan itself is not. The upper house is currently debating the bills, and is expected to approve them sometime next month. But even if it doesn't, the legislation will be sent back to the lower house for a second vote that, if passed, would make it law. Abe's government argues that the changes are needed for Japan to respond to a harsher security environment, including a more assertive China and growing terrorist threats, and to fulfill expectations that it will contribute more to global peacekeeping efforts. The bills are based on the Abe Cabinet's decision to alter the interpretation of Japan's constitution, drawn up by the occupying U.S. military after World War II, and not the constitution itself, which prohibits the country using force for purposes other than its own self-defense. Dozens of legal experts and other academics have questioned the bills' constitutionality, saying they go beyond what's written in the charter. Half a century ago, 300,000 students, many of them Marxist ideologues, staged violent protests, repeatedly clashing with police, over revising the U.S.-Japan security treaty. Those protests played a role in driving Abe's grandfather, then-prime minister Nobusuke Kishi, out of office after his government approved it. "Compared to 1960, it is much different this time, and there are relatively few young people involved. Our generation and housewives, these people are demonstrating in a much more peaceful manner than 1960," he said. Students today don't like those violent images of activists either. Their weekly Friday evening rallies draw several thousand young people who peacefully chant in hip-hop rhythm to the sound of drums. A group of four students went on a hunger strike last Friday, quietly sitting outside the parliament complex, taking photos with visitors as policemen walked by. Daisuke Motoki, a 22-year old student at Tokyo's Senshu University, said he joined the hunger strike as a non-violent form of protest to show their determination. "There seems to be a growing pressure from the university that makes it harder for us to be politically active," he said. Stephen Nagy, professor of politics and international studies at International Christian University in Tokyo, said today's student protesters are neither political ideologues nor radicals. "The difference stems from Japan's apolitical post-World War II society, the lack of political diversity and affluence which decreases incentive to be politically active and knowledgeable," he said. "I think there are a growing number of people like me who realized our have only turned worse under Abe's government," she said. "I hope more people would be interested in politics and speak up."